Auriga Research is one of the leading Contract Research and Testing Organization (CRO) with 33 years of illustrious Industry experience, especially into analytical, Bio-analytical and Clinical services. Auriga boasts of 2 Clinical Units with 6 State-of-the-Art Laboratories with a dedicated team of more than 550 people redefining trust in the brand. Auriga has been instrumental in successfully submitting more than 175 Bio-equivalence Studies with global client base. Auriga has expertise in Bioequivalence Studies, Method Development and Validation, Stability Studies, and Formulation Development for Pharmaceutical Industries. 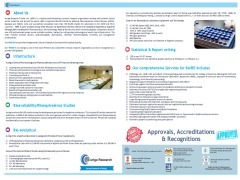 Auriga is accredited and approved by DCGI, NABL, NPRA Malaysia, FSSAI, CDSCO ect. Your message will be sent directly to Auriga Research Pvt Ltd and will be answered at their discretion.